Incidentally, I’m always amused that Father Le Jeune saw fit to teach his Aboriginal readership about US rather than Canadian geography! I can imagine their confusion. Sam did a nice job extracting the gist from the shorthand Chinook Jargon. His quick progress at reading it shows that you can indeed get yourself direct access to that treasure trove of firsthand material. With Sam’s blessing, I’m reproducing his translation, which you can compare with my rendition of the Chinuk Wawa and its meaning. I’ll remind you that “=” is not an equals sign but a section-dividing punctuation mark in the Chinuk pipa shorthand. I’m putting asterisks next to a couple of notable points that I’ll discuss at the end. My suggested translation is in quotation marks. 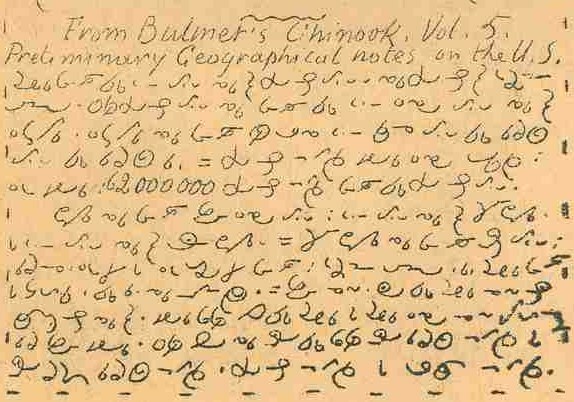 From Bulmer’s Chinook Volume 5. Preliminary geographical notes on the US. ayu klaska: 62 000 000 Boston tilikom mitlait kopa Boston Ilihi. there are many 62 million Boston people living in Boston land. America is among the big lands whose name is North America. And one land is named South America. North America it is three countries. tlus nanich kanawi tilikom, Boston tilikom pi Sawash tilikom. Boston people and Indian people. iht, literally ‘one’, normally connotes ‘a particular one’ in Kamloops-area CJ. Boston is one of the words used for ‘white people’ in the Kamloops area, not necessarily implying a US identity. For Bulmer, a Briton who I infer picked up much of his Chinook Jargon by reading, this word probably meant ‘citizen of the USA’ unambiguously. But for Le Jeune’s readers this wouldn’t necessarily have been entailed by its association with whites. aias for ‘bigger’: it’s incredibly hard to find examples of overt comparative-adjective formations in the Kamloops area. Most often, degrees of scalar adjectives are left implicit. All this is to tell you that Le Jeune’s readers could easily have inferred exactly what Bulmer intended, namely that one ilihi was part of another bigger ilihi. mitlait ‘has’: note that the preceding uses of mitlait were locational, while this example, also legit, is possessive. snas kol: I find it hard to imagine that either Bulmer or, recopying him, Le Jeune, would make a grammatical mistake of this order in expressing ‘snow’. This seems perhaps one of Le Jeune’s rare–given his enormous published output–writing mistakes. Intended was surely kol snas, literally ‘cold rain’. taii haws…taii tawn: both straightforward in that taii routinely modifies other nouns to convey ‘main, primary, leading’. But just try nailing down the sense of taii haws if you were a BC Indian unfamiliar with the USA’s bicameral legislature! And even taii tawn doesn’t necessarily convey the same idea as ‘capital’; it’s got a more pragmatic sense of the main city of a district, such as Vancouver as opposed to Victoria. los: the wholesale importation of an English-language plural, ‘laws’, is pretty uncharacteristic of Father Le Jeune’s quite fluent CJ use. This looks like an earmark of Bulmer’s authorship. On the other hand, iaka (literally ‘he/she/it’) to refer to a plural noun (‘laws’) is characteristic of Kamloops-area, and Indigenous people’s, Chinook Jargon! Overall, there are internal clues in this short text that show Bulmer’s distinct authorial voice in Jargon, as well as those that indicate Le Jeune acting as not only his copyist but his editor. This late 1800s text provides a fascinating little study in that time’s approaches to Western-style education of Aboriginal people. It definitely demonstrates that Bulmer and Le Jeune shared the notion that Chinook Jargon wasn’t a mere useless trade lingo, but instead a tool for conveying real and valuable information. thanks for sharing your insights on this treasure trove of Chinook Wawa. it is interesting that the pronouns distinguish plural and singular -yaka/klaska, naika/nesaika but most other words do not. could lejeune be following past Wawa practice in its ambivalence about such distinctions eg adopting plural French words for use as singular. We would expect every human language to overtly show a singular/plural distinction, if only in the pronoun system–and, like Kamloops use of Chinook Jargon, that distinction might be weak or missing in the third person. Lots of other languages are like that. Chinook Jargon has a universal tendency to use a single form of a noun for both plural and singular. It’s pretty much an accident whether that form was a singular or a plural in whatever language donated the word to CJ. The text shown in this blog post is very unusual in using both forms from English (law, laws). My sense is that this reflects Bulmer’s choices, not Le Jeune’s.Bulmer could have gotten “mamook law” from one the existing books on CJ, but then slipped into writing “los” (laws) under his own steam. The technically singular pronoun “iaka” to refer to this explicitly plural noun–now that’s strongly suggestive of Le Jeune’s editorial touch. I feel it’s a strong argument against those who say pidgins aren’t real languages, that we can detect distinct authorial “voices” in Chinook Jargon. I see this happen quite a lot in the voluminous Kamloops-area collection of materials. It makes me smile to “feel” who is writing when I read this stuff. yes tyee house may mean parliament/legislature or main building but I note that in Lejeune’s 1924 Chinook Rudiments he lists its meaning as ‘toilet’. I’ve been known to point out to those who think this ‘Jargon is not a language the many examples of humour conveyed in it. You just found another, I think!